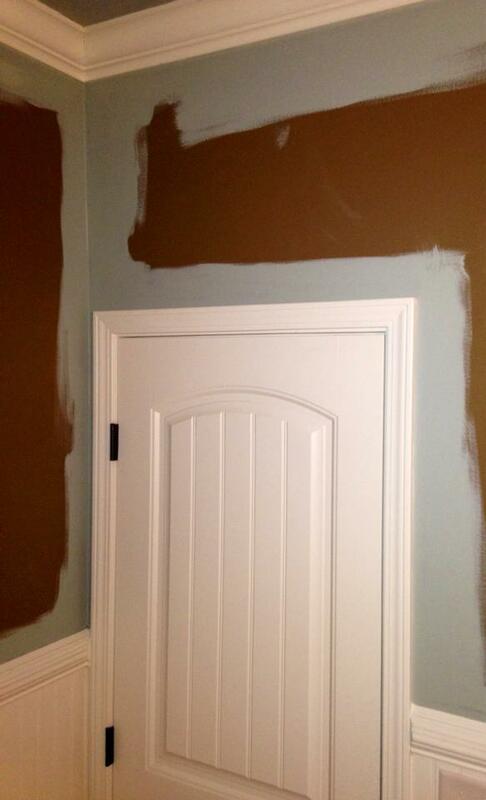 Have you ever painted a room and known almost immediately that it's just not what you want? Well, that was me a little over a year ago in my powder room. We'd just moved into our new home and I was wanting to re-paint almost every room in the house and the paint costs were adding up quickly. With all the other things that I was buying for the house, I thought I'd save a bit and use some left-over paint...oh, why didn't I just get pick out the color I wanted? I snapped this pic with my phone after I started painting, but the former color was a dark brown. It comes across yellowish here, but it wasn't that way...just a darker brown. On one hand, I loved the contrast with the white trim and wainscoting walls, but it just wasn't the right shade. I finally got the inspiration to re-paint it after seeing my mom's dining room painted in Sherwin William's "Silvermist". You'll have to excuse my photography quality here... It was very difficult to get pictures of this little room with no natural light. You should have seen me trying to get shots with this large mirror facing me... lots of leaning! I just love how the Silvermist turned out...much lighter and brighter! I adore paint colors that show several hues and this one is such a great mix of blue, green, and gray. I wanted something inexpensive to coordinate with the butterflies and this watercolor-like bird fabric was just the ticket (the pic below is the true color). If you find fabric you love, don't forget that it can easily be wall art as well as the customary pillows, drapes, etc. It's as easy as picking out frames, cutting the fabric and some mat board to size, ironing the fabric and adhering to the mat board with spray adhesive, and hanging! It's always amazing what a little paint can do for a room...next time, I won't be settling with color I'm not in love with either! Sooo pretty! Love your fabric art <3! Popped over from Home Sweet Home! Have a great evening! beautiful and fresh! love the vase with the branch, too! Your powder room is so charming! What a beautiful makeover you did. I love the wall color and the wainscoting, too. I've thought about that for our bathroom! OH, I love it! I really like the wall color and butterfly print. I am looking for a color similar to this for our nursery....I'll be checking out Silvermist soon. This is so pretty...I love the paint color you chose, that's the hardest part. Your mirror is gorgeous and I want to add a shelf to my bathroom, too. The branches look fantastic with the pops of brown! It all looks so pretty!! I love the new color! Kristin it turned out perfect! I beautiful color in the small space. Love your nature inspired artwork to pieces. Oh, so pretty! I esp love the butterflies & birds. I just bought a pillow with a colorful bird on it yesterday & was wondering how to incorporate at least one more 'bird' item. I'm inspired. Kristen, it looks so good in the new color. I used that color on a piece of furniture one time. I love it. 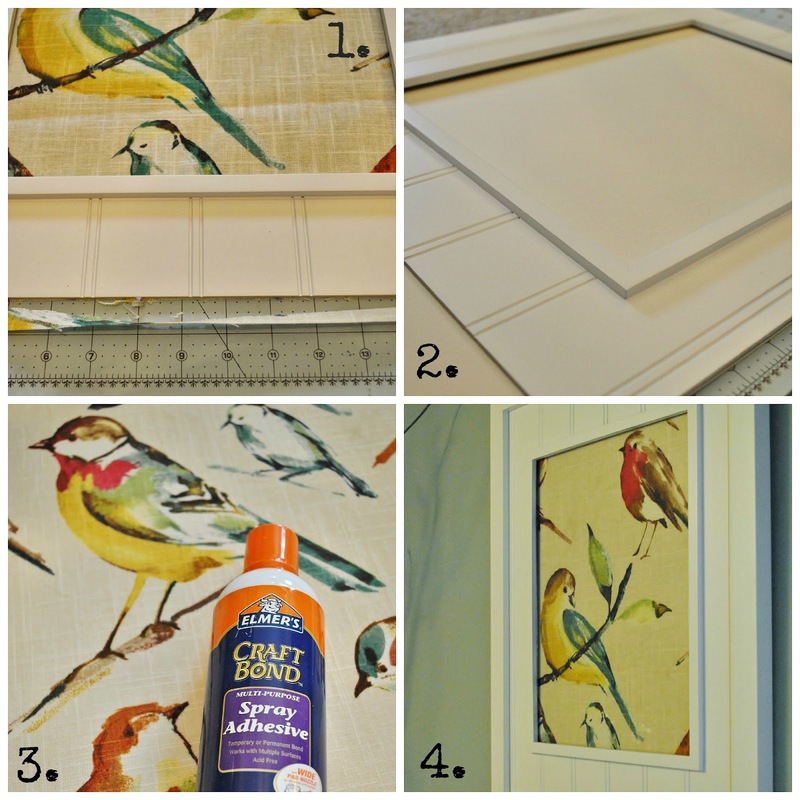 Great framed bird fabric. Love the color love the entire room! Super cute wall art too! Love the color and love the entire room! Cute wall art. Looks beautiful! I love that color. I have found too, that settling for a paint color is just not feasible. You did a great job with the accessories. The mirror is stunning! I love, love the fabric!...so beautiful...you did a terrific job as usual!!! Have a great weekend Kristen! Such a gorgeous room, sure turned out great the 2nd. time huh? Probably great 1st. time also but if it's not what you have pictured in your mind and want then it's just not gonna make it. We bought a mistake paint at Walmart for our guest bathroom. It's a brown but had way too much green in it so we added some yellow to it so it evened out the color. We also have a sky light in our guest bath so that helps so much to keep it from looking too dark. All the trim is white which helped immensely. We have a little cupboard above the commode. It was one of those you put over the commode with legs that go behind the toilet but I had hubs cut those off, what a difference it makes. So glad for you to get your bath the way you want it, makes such a difference every time you go into that room. I've seen this color before and love it, Kristen! I'm thinking about using it myself in the master bathroom, when we paint the whole place this year. That's a great color! I can't i magine it with such a dark color. I like all your details even the simple branches. They add just the right artistic touch! Your art work turned out great! Yes I did paint a room (my bathroom) and knew I didn't like it right away. I haven't changed it yet but I hope to soon! I love the color that you chose! And I like your fabric wall art too! Much brighter and fresh looking! This room is so charming! I love those frames - especially the framed butterfly print! Thanks for this wonderful inspiration you shared Kristen! Gorgeous makeover! Love it. The artwork is wonderful. I'm a new follower. Stop by for a visit. Your bathroom is very pretty. I like the contrast of the light walls and the dark faucet and accessories. The artwork is wonderful. This post proves my point: you can put some sticks in a vase and make it look like art. You rock! Love the butterfly print in there. That is where it was meant to be. That room looks amazing--love the beadboard and I haven't seen that type of door before. Looks fantastic! I want to move into your powder room! This is very close to the color I used in my last two living rooms and it's unbelievable how it just goes with everything! We're getting ready to do some wall repair in our living room and it's a perfect time to change wall colors, but I'm hard pressed to find one I love as much as these colors. I absolutely LOVE this makeover. That color is amazing! Love this room...love the dark floors and your wall color! Perfect inspiration for me as I want to do my bathroom over! Coming by to let you know that you have been featured at Nifty Thrifty Tuesday..please feel free to grab my featured button (it's located under my header) for your blog. The makeover looks outstanding...the new color is so much better for this room. looks gorgeous! I bet you are enjoying the new, lighter look so much :) beautiful. This is so my style! Love it! Kristen, your bathroom is so pretty and cheerful looking. The colors are lovely and the bird prints and butterflies are a wonderful complement to each other. Had a little time to do some blog browsing this morning! So glad I did - your bathroom makeover is wonderful!! I just spent most of the day yesterday cleaning the laundry room and half bath thinking I need to freshen up these rooms. I love the color you chose for your bathroom. You have inspired me!! What a lovely space you have created. I love the colors and the beadboard. I just finishing giving my bathroom a little upgrade too and I am so happy. I am sure you are enjoying your new beautiful space. Nice job. Love the updated hue in your powder romm!!! The natural elements are stunning!!! The tree branch in the glass bottle...fabulous!!! What an amazing transformation!!! Visiting from Amy's All Things Home!!! From one farm gal to another-you have a beautiful blog and wonderful decorating styles. Kristen! I love your name! :)You have a beautiful home and I love the makeover of your powder room. It's amazing what a little paint can do. Silvermist is one of my favorites and it looks so good with the with white board. 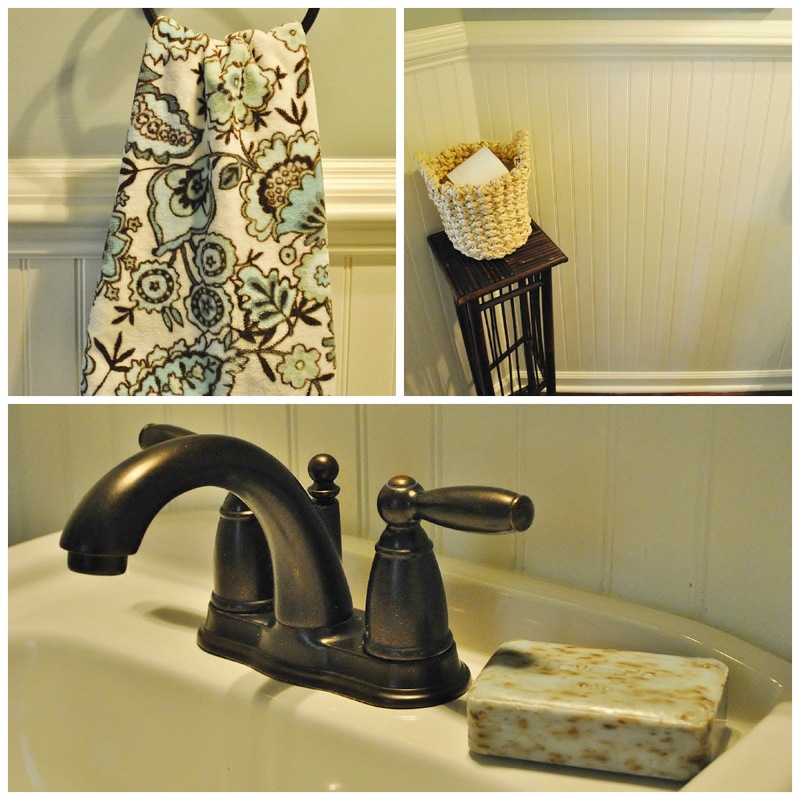 I just wanted to let you know I featured your bathroom on my blog today. Thank you for the great inspiration and have a great day! found you through the favoritepaintcolorsblog. I did the same thing, sort of. I'd pick up $5 mis-tints thinking I had a bargain, only to hate it and go out and buy what I really wanted in the first place. Your fabric art is lovely. My master is this Silver Mist also.